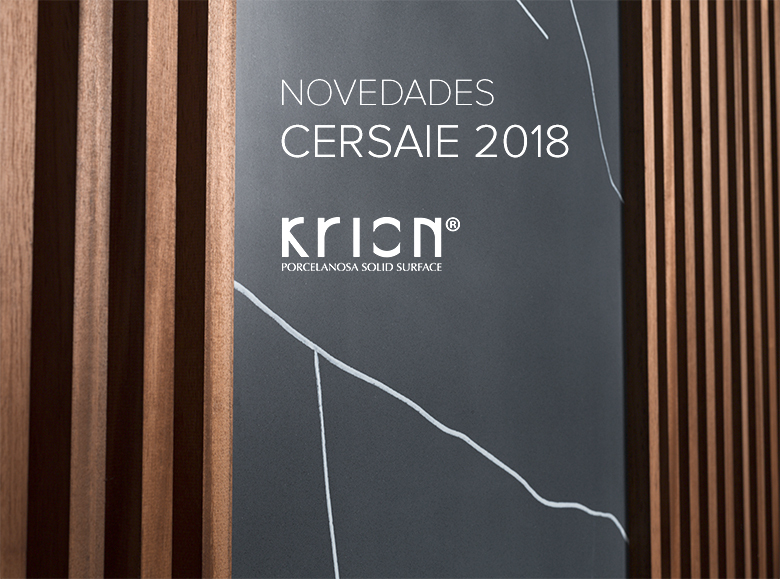 From the 24th to the 28th of September, one of the most important events of the year is held in Bologna, Italy: CERSAIE, where KRION® presents all its new products, including a new series with three new colours. CERSAIE International Exhibition of Ceramic Tile and Bathroom Furnishings has opened its doors in Bologna with over 800 exhibitors, where PORCELANOSA Group has two stands, one Premium, exhibiting all the new KRION® Porcelanosa Solid Surface products. With a groundbreaking presentation and commitment to setting new trends on the market, the firm is exhibiting KRION® Customer Material Experience, an area developed exclusively for clients, recreating a unique experience using KRION® as a material explored from a design perspective. KRION® launches its new Art Veins Series, three new colours characterised by their distinctive, subtle, defined lines, with a bold, modern pattern on a uniform background full of small particles which give the sensation of depth: V101 Bianco Opera, V501 Noce Atrio and V901 Nero Palazzo, available in 3680 x 760 x 12mm format. The acclaimed KRION® Luxury Series colours, inspired by natural stone, will be available from autumn in 6mm format, which will facilitate the creation of new and impressive projects thanks to the new lighter, more transformable format with better possibilities for thermoforming and finishing. The classic 12mm thickness will also be maintained. The colours which will be available in 6mm will be: L101 Carrara Soft, L102 Nacar, L103 Snow Fall, L105 Carrara Dark, L505 Beige Marfil and L903 Grey Cement. The SLANT washbasin is presented as an exclusive embedded washbasin for offering a new level of aesthetic finish, suitable for domestic and public use, measuring 38 x 28cm and 48 x 28cm. A series of accessories has been launched, intended to cover the different needs of clients, using the latest advances in both assembly and installation. The first in this family is the new inductive charger, easily installed in any KRION® project and suitable for charging any mobile device quickly and effectively.